I was recently asked to give a talk called, “The Approaching US Energy-Economic Crisis.” In other words, how might the United States encounter problems that lead to a crisis? As we will see, many of the problems that could lead to a crisis (such as increased wage disparity and difficulty in collecting enough taxes) are issues that we are already beginning to encounter. In this talk, I first discuss the connection between energy and the economy. Without this connection, it doesn’t make sense to talk about a crisis arising with respect to energy and the economy. 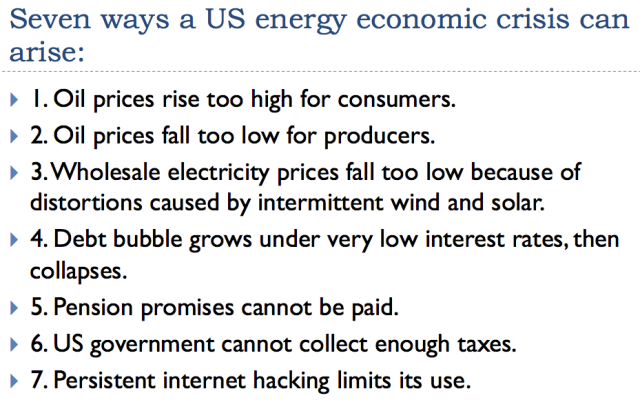 I then discuss seven issues that could lead to a U.S. energy-economic crisis. 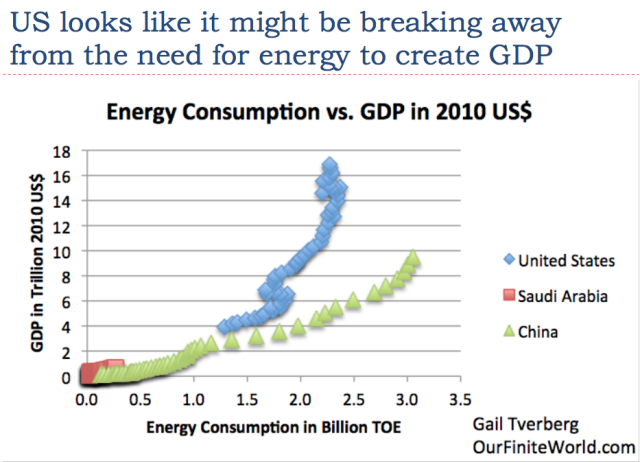 If we look at world data, it is clear that there is a close tie between energy consumption and economic growth. On an individual country basis, there can be the belief that we have reached a new situation where a particular country doesn’t really need growing energy supply for economic growth. 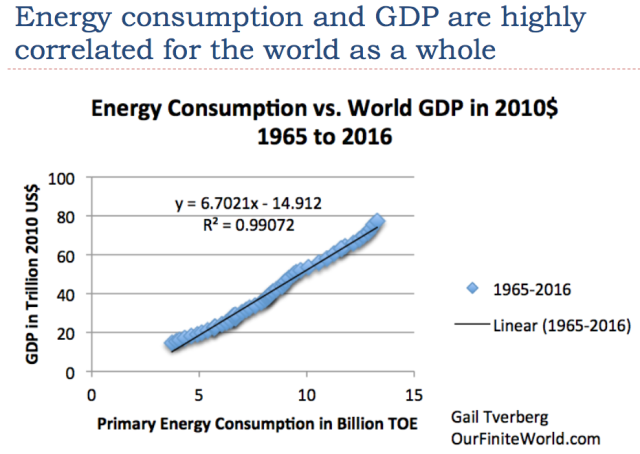 For example, on Slide 3, the recent nearly vertical line for the U.S. suggests that the U.S. economy can grow with almost no increase in annual energy consumption. This rather strange situation arises because the standard calculation misses energy embodied in imported goods. Thus, if the United States wants to outsource a great deal of its manufacturing to China, the energy consumption used in making these goods will appear in China’s data, not in the United States’ data. This makes the country that has outsourced manufacturing look very good, both with respect to energy consumption and CO2 emissions. Buying imported crude oil from elsewhere (such as Saudi Arabia) is also helpful in keeping down energy consumption, because it takes energy of various types to extract oil. If oil extraction takes place in Saudi Arabia, using steel pipes from China, the energy used in extraction will appear in the data of China and Saudi Arabia. 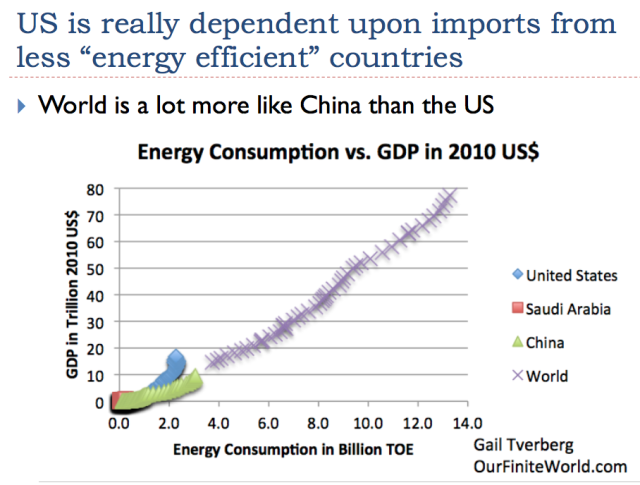 Neither China nor Saudi Arabia obtains as much economic growth, relative to its energy expenditures, as does the U.S. In order to make sense of what is happening, we need to look at the world total. - By individual citizens, to cook food, to heat homes, and for transportation. There are many self-organized systems that seem to grow of their own accord in the presence of available energy supplies (that is, in thermodynamically open systems). Plants and animals are examples of growing self-organized systems. Hurricanes, ecosystems, and stars are also such systems. Economies also seem to be such systems. The name given to such a system is a dissipative system. I visualize the world economy as being somewhat like a child’s building toy. It consists of many different elements, a few of which are listed on Slide 5. An economy is self-organized in that new businesses are formed when some entrepreneur sees an opportunity. Consumers decide which product to buy based on which product best serves their needs and based on price. Governments decide on changes to laws and tax levels, depending upon how the economy is functioning at a given time. This system gradually grows over time, as more businesses and customers are added. As new products and new businesses are added, products and businesses that are no longer needed are taken away. For example, when the private passenger automobile was invented, there was no longer a need to feed and house a large number of horses to be used for transportation purposes. Thus, the system self-organized to eliminate the services needed to care for the many horses used for transportation. Even if we wanted to get rid of cars and go back to horses, we really could not do so now. In some sense, the structure shown on Slide 5 is hollow, because prior capabilities that are no longer needed tend to disappear. The hollow nature of the economy makes it almost impossible to go backward if we somehow lose our existing capabilities–not enough oil, or an electricity problem, or an international trade problem, or a financial problem. Instead, we will need to build new systems that will function in the new context: depleted resources, a very high population level, high pollution levels, and degraded soils. 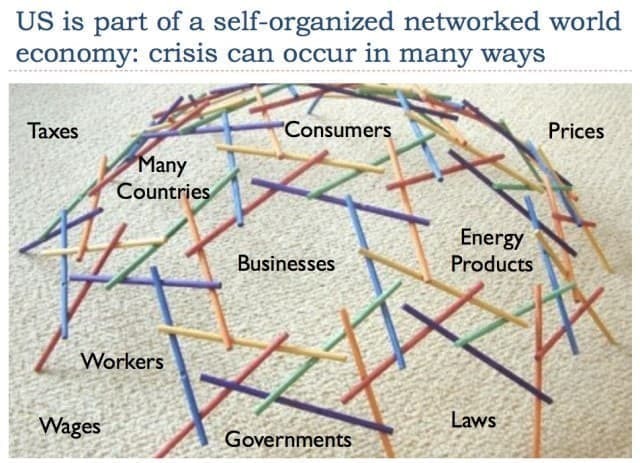 The existing self-organized system is likely to collapse back to only the part that can be sustained. Slide 6 is a preview of where this presentation is headed. 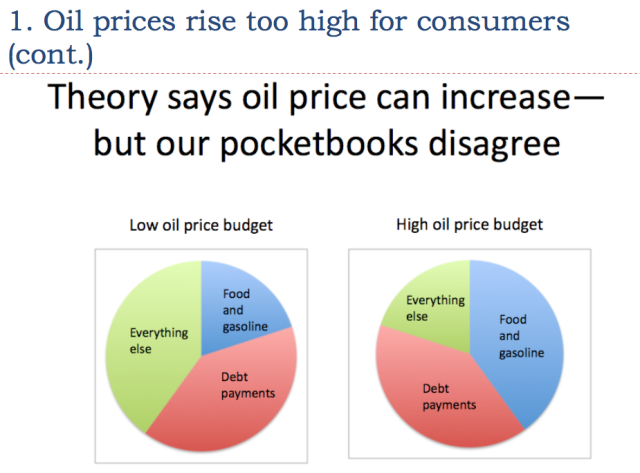 Slide 7 describes the issue most people are concerned about: oil prices will rise too high for consumers. In fact, we clearly have had problems with high prices in the recent past. 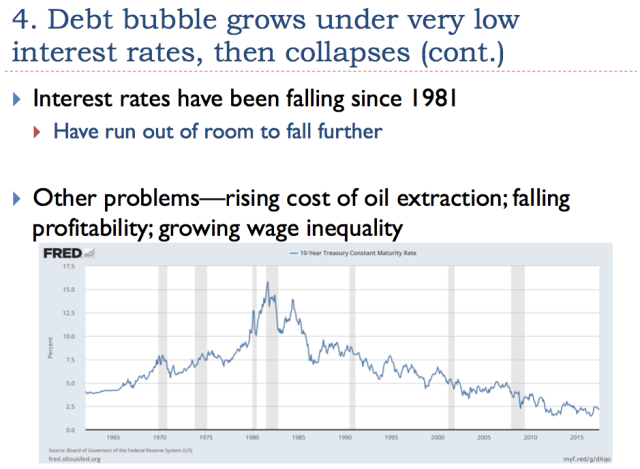 The high prices in 2007 and early 2008 seem to have punctured the debt bubble that existed at that time, as I discuss in an academic article, Oil Supply Limits and the Continuing Financial Crisis. Some of this low interest debt can be used by governments to provide funding for unemployment benefits and projects such as road building. Some of this low interest debt can be used by businesses to open new factories, and thus hire more workers. Some of this low interest debt can be used by individual citizens to purchase a home, a car, or a college education. It is the pumping up of the economy with low interest debt that seems to stimulate the economy in a way that raises oil prices. 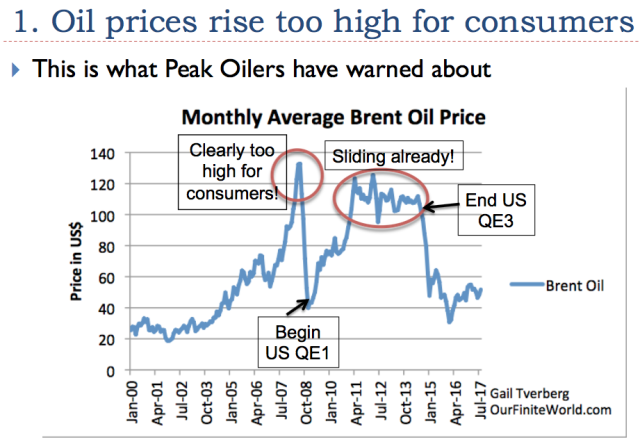 When the U.S. discontinued its third and last phase of QE in late 2014 (shown as “End US QE3” in Slide 7), the pumping up action began to disappear, and oil prices again fell. Essential goods whose prices are very much influenced by the price of oil, such as food and gasoline. Besides food and gasoline, the cost of replacing a road, particularly with asphalt, very much depends on the price of oil. Higher costs for roads will be reflected in taxes that we are required to pay. Almost any kind of product that is shipped is affected by the price of oil, because oil is the usual transport fuel. Oil is typically used in the extraction of metal ores, so the price of metals used in making cars, appliances, and other goods is affected by the price of oil. Thus, an oil price increase indirectly leads to inflation in the cost of a wide range of essential goods and services. To make matters worse, fluctuations in the price of oil can be very large. Between 2000 and 2008, we saw monthly average oil price fluctuate from under $20 per barrel to over $130 per barrel. Thus, while the growth in the food and gasoline segment is somewhat exaggerated, the impact of price changes is much larger than a person might expect, looking only at the impact of higher gasoline prices for a consumer’s vehicle. Repayment of loans, such as mortgage payments and auto payments. Loan repayments of these types tend to make up a large portion of most people’s spending. If people don’t own their own home, they have rent payments to make. These rent payments are in some ways similar to loan payments, because they indirectly cover the cost of someone else’s mortgage. These costs tend to be fixed, even if the price of oil goes up. Everything else. These are the non-essential items that we cut back on when budgets are too tight. Examples include charitable contributions, visits to restaurants, and vacation trips. 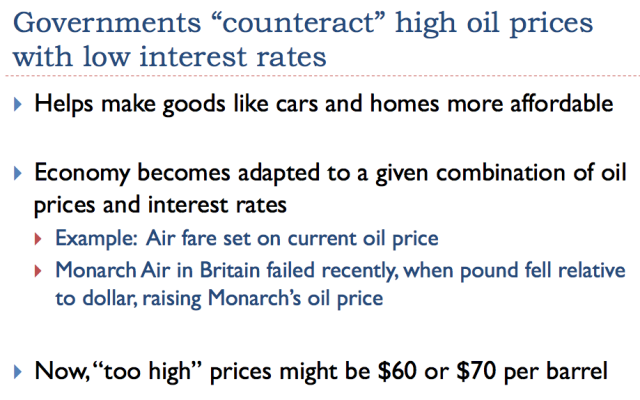 Looking at Slide 8, it becomes clear that if a government wants to “counteract” high oil prices, it needs to lower interest rates. This will tend to make car payments, mortgage payments, educational loans, and even rents somewhat more affordable, at least for people whose loans are affected by the new low interest rates. Often, homeowners are allowed to refinance, to take advantage of the new lower interest rates. The plan this year is to raise, rather than lower, interest rates. Needless to say, this has the opposite effect; it tends to reduce the size of the “everything else” segment of our income. This effect tends to be recessionary. Monarch Air is a British airline that failed recently. It boasted very low fares. 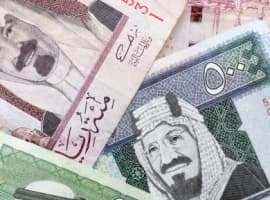 One of the problems leading to its failure was a falling pound relative to the U.S. dollar, raising both the price of oil and the price of new airplanes. Today, the price that oil producers need, including adequate funds for (a) reinvestment and (b) the high taxes that governments need to continue their programs, is likely $100 per barrel or more. Such a price would likely cause recession, because purchases in the “Everything Else” category on Slide 8 would be squeezed. 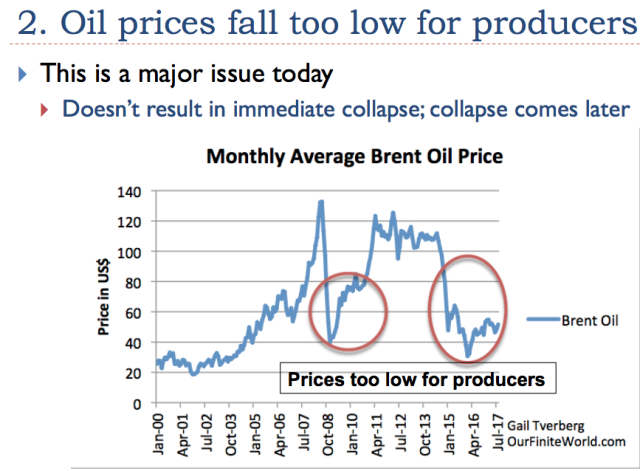 Most people don’t think about the possibility of oil prices falling too low for producers, but this is a major problem today. When prices are too low, oil companies need to borrow money to continue to operate. They are likely to cut back on developing new extraction sites. 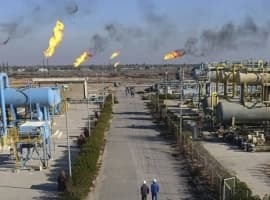 With low prices, the tax revenue that the governments of oil-exporting countries are able to collect tends to fall too low, leading to cutbacks in government programs and a need for more debt. Saudi Arabia is running into this difficulty. 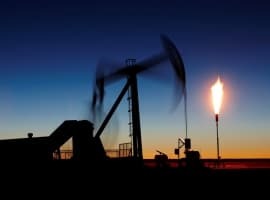 The problems that arise from low oil prices can be hidden for quite a while, because investors are likely to see the low prices as a great opportunity. They think, “Surely, oil prices will rise again.” So investors are eager to buy more shares of stock, and banks are willing to issue more debt. At some point, the situation becomes unsustainable, and no more loans are offered. It has now been about three years since prices fell to a level that is clearly too low for oil producers. It cannot be many more years before something has to “break.” Venezuela is an oil exporter that cannot collect enough revenue from oil exports to afford needed goods, such as food. Other oil exporters may eventually encounter similar problems. A major reason for falling oil prices is growing wage disparity and the resulting loss in purchasing power for the bottom 90 percent of workers. In the United States, the bottom 90 percent obtained about 62 percent of total income as recently as 1992. In a 2016 Federal Reserve survey, only 49.7 percent of total income went to the bottom 90 percent. 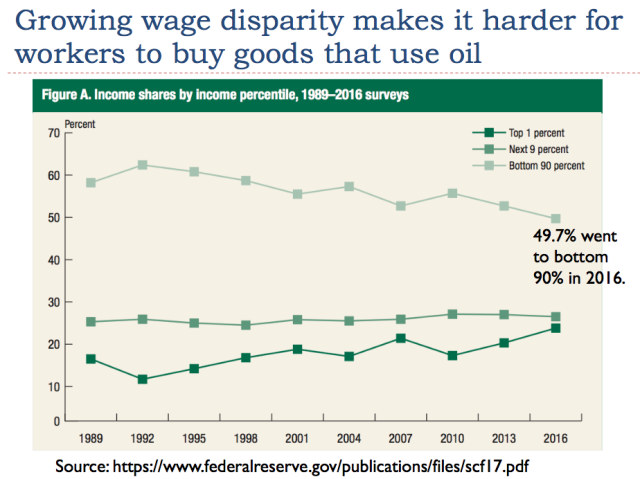 The reason why wage disparity is important is because the wealthiest 1 percent (or even the wealthiest 10 percent) can’t purchase very much of the goods created using oil. The wealthiest 1 percent can’t eat very much more food than everyone else. They can only drive one car at a time. In order to have adequate demand for oil, the bottom 90 percent must have adequate purchasing power for goods such as homes and cars. If young people live with their parents longer, and aren’t able to afford homes, this holds down demand for oil. So does transferring manufacturing to countries where wages are so low that few people can afford cars and other manufactured goods. 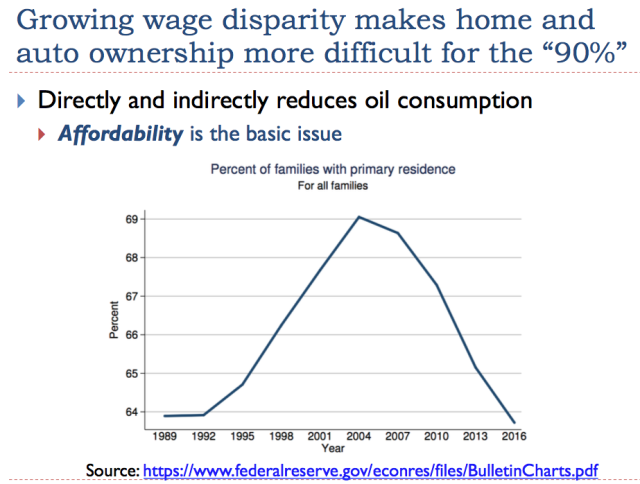 Slide 12 shows the Federal Reserve’s graph of the share of families who own (as opposed to rent) their primary residence. There has been a drop in homeownership from 69 percent in 2004 to less than 64 percent in 2016. This is a period when wage disparity has been increasing. 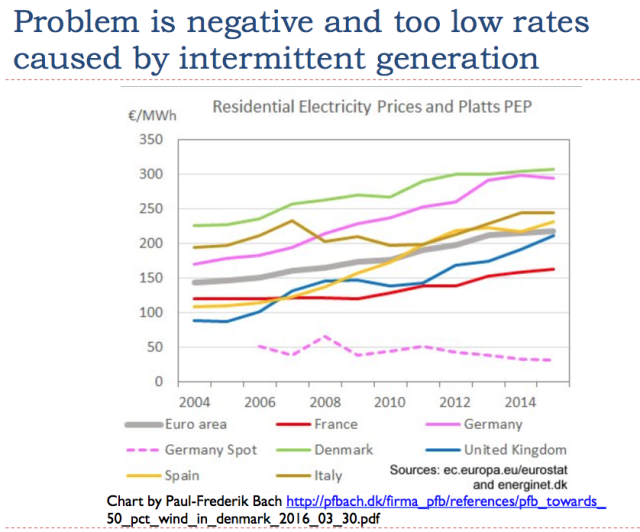 Intermittency becomes a major problem when wind and solar are added to the electric grid. Wholesale electricity prices may drop to very low levels when both wind and solar electricity are available. At times, prices may become negative. 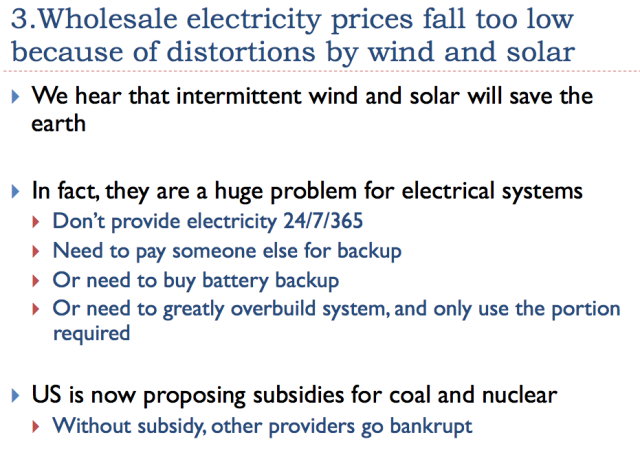 Electricity generation that is designed to be used most of the time (such as coal, nuclear, and even some types of natural gas generation) cannot survive without subsidies to offset the artificially low prices the system produces. The need for subsidies for backup electricity providers is really an indirect cost of adding intermittent types of electricity to the grid, but today’s pricing does not reflect this. A different workaround for intermittency is to add a large amount of battery backup or other type of storage. In theory, batteries could be used to store electricity generated in the summer for use in the winter, when heating needs are greatest. Another approach to intermittency is to greatly overbuild intermittent renewables, with the idea of using only that portion of electricity generation that is really needed at any point in time. Yet another approach is adding extra (lightly used) long distance transmission, to try to smooth out fluctuations. The dotted line on Slide 14 shows the downward trend in German wholesale electricity prices, as more and more intermittent electricity has been added to the grid. At the same time, total residential electricity prices have risen to higher and higher levels. 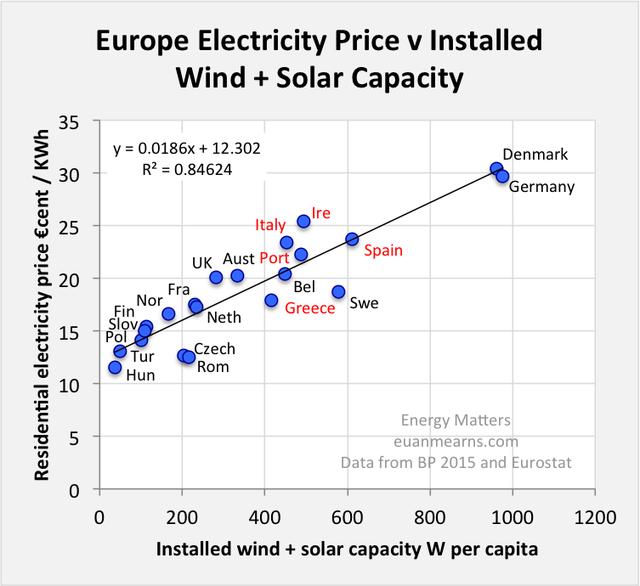 The countries with the greatest use of wind and solar tend to have the highest retail rates, as shown in Figure 1 below (not in presentation). As we discussed earlier, the “standard” workaround for high oil prices is low interest rates, because of the relationship shown in Slide 8. At some point, however, interest rates fall about as low as they can go. The interest rates shown on Slide 16 are those for 10-year treasuries. These typically underlie mortgage rates. These rates have been falling since 1981, helping to prop up prices for homes, land, farmland, and other assets purchased with long-term debt. Low interest rates make monthly payments more affordable than high interest rates, so more people can afford to buy such assets. With greater demand, asset prices tend to rise. Also, with all of the talk about the U.S. continuing to raise interest rates, those owning bonds realize that rising interest rates will cause the selling price of bonds they hold in their portfolio to fall. Thus, pension funds and other organizations that are making a choice between buying bonds (which are certain to fall in selling price, as interest rates rise) and buying stocks, will choose to “overweight” stocks in new purchases for their portfolios. This will tend to push the price of stocks higher, regardless of the earnings potential of the underlying companies. One thing I didn’t mention in the presentation, but is probably worthwhile pointing out here: Short-term interest rates have been rising since late 2014, even as 10-year treasuries have been holding fairly steady (Figure 2, below). These shorter-term interest rates affect payments on other types of transactions–adjustable rate mortgages and auto loans, for example. Figure 2. Chart showing 3-month, 1-year, and 2-year interest rates. Chart created by St. Louis Federal Reserve. These short-term interest rates have been creeping upward, indirectly making certain types of goods less affordable. The increase in short-term interest rates will, by itself, push the economy in the direction of recession. 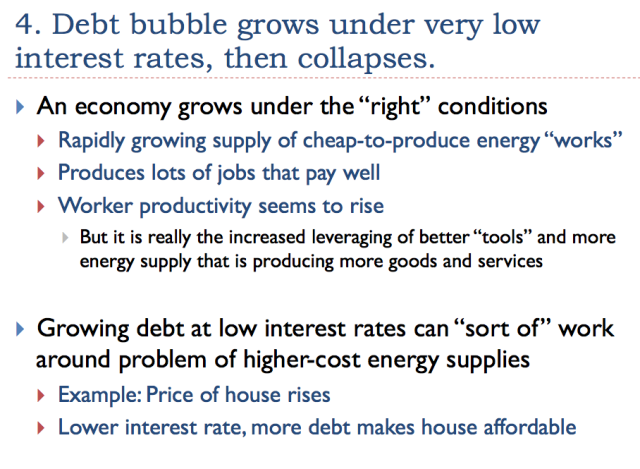 Eventually, the bubble in asset prices can be expected to collapse, as it did in 2008. Perhaps this will happen when corporate profits fall too low; perhaps this will happen when the economy hits recession. The prices of many types of assets, including shares of stock, prices of homes, and prices of businesses can be expected to fall. There are likely to be many debt defaults in the governmental, business, and personal sectors of the economy. In such a situation, banks may fail. The goods and services that are delivered each year require the use of physical resources such as oil, coal, natural gas, metals from ores, and wood. In the past, the quantity of these physical resources has grown, year after year, as illustrated in Scenario 1. In a finite world, we cannot expect the amount of physical resources to grow, indefinitely. 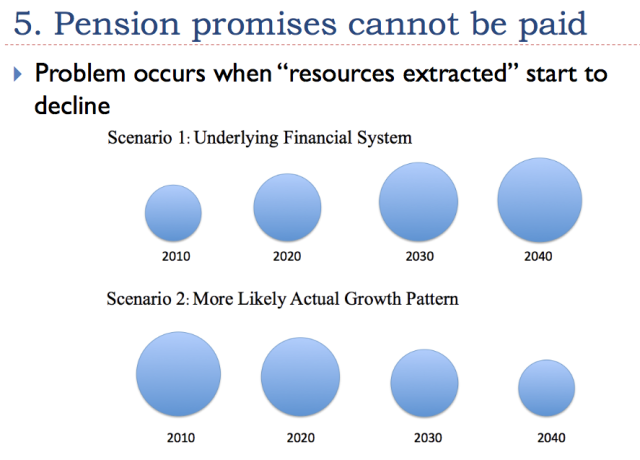 At some point something will go wrong, and the amount of resources extracted each year will become start becoming smaller, as in Scenario 2. In a sense, the people of the world can expect to become poorer, because the quantity of goods and services that can be made with these resources grows smaller, instead of larger, and each person’s share of the world output becomes smaller. Standard economic theory says that resource prices will rise, as the quantity of resources falls, but this view does not take into account the way a networked economy really works. With greater wage disparity, a smaller share of people will be able to afford to buy homes and cars. Scenario 2 in Slide 17 will occur, not because we “run out,” but because too few people can afford to buy goods made with oil, gas, coal, metals and wood. Market prices will fall below the cost of extracting the necessary resources, and companies in these businesses will fail. Governments of oil exporters may collapse, because they cannot collect sufficient tax revenue at the low price available on world markets. If there are physically less goods and services available, who will get the benefit of these goods and services? 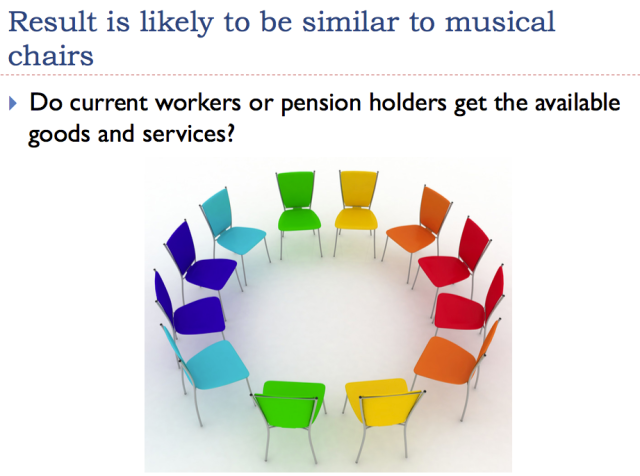 I see the situation as almost like musical chairs. Will it be pensioners who lose out, as bonds held by commercial pension programs default, and also as governmental plans are cut back? Or will it be the wages of the less skilled workers that are cut, as more processes are automated, and only managers and highly skilled workers are needed? If this happens, won’t commodity prices fall even further? We really need to have adequate wage levels for a wide range of workers, if we expect to have enough buyers for the goods produced. Historically, when collapses have occurred, governments have lost out in the game of musical chairs because they could not collect enough tax revenue. The problem was that the bottom 90 percent of workers became poorer and poorer, and so less able to pay taxes. This brings us to our next potential U.S. problem area. 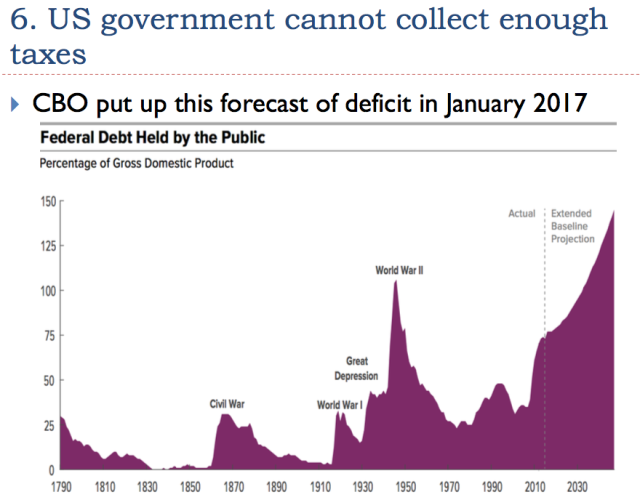 In January 2017, the U.S. Congressional Budget Office made a projection of how federal debt held by the public would grow, based upon the information available at that time. Their forecast was that the debt would grow to amount to nearly 150 percent of GDP. This would be a much higher level than during World War II, World War I, or the Civil War (Slide 19). Since January 2017, more information has become available. We now know about three hurricanes, plus fires in California. Citizens affected by these events need financial support. We also know about proposed legislation to reduce taxes, especially for businesses and high-income individuals. 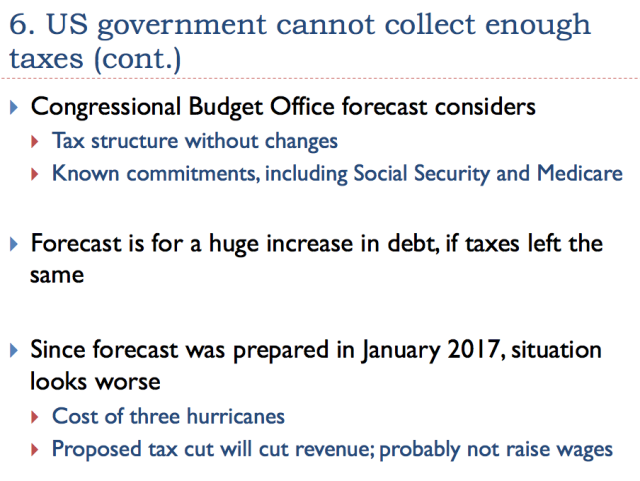 These proposals are likely to increase after-tax wage disparity, and increase the amount of the deficit. If corporations choose to return any of the benefit of the tax cut, it will likely be through dividends to those who are already wealthy. With respect to corporate tax rates, we are only trying to catch up with tax havens, so it is difficult to believe that the tax change will result in much more U.S. investment. In the United States, we seem to hear one story after another about the internet being hacked. The most recent story involves a major hack of the data collected by Equifax for the purpose of determining the credit-worthiness of individuals in the U.S. If this data gets into the wrong hands, it can be used for “Identity Theft.” An impostor can apply for a new loan in the name of someone else, or can steal an income tax refund intended for someone else. A different hacking situation in the Atlanta area recently led to the theft of a large number of checks intended for direct deposit in teachers’ bank accounts being stolen. They were instead direct deposited to an impostor’s account. Clearly this list of potential problems is not complete. Hopefully, this list gives an idea of the wide range of issues we are facing. you explain the obvious problems which most people can foresee but what are your solutions? I like how you've broken down the problem and how interconnected they all are but what do you propose we do about them? Automation is still coming on board and capitalism is starting to fail. Capitalism has become unchecked and is failing society to few are getting ahead. Some scholars suggest UBI and taxing automation but I see this causing societal problems especially with outsourcing. Even offshoring is failing with automation which is starting to reak havoc across the globe. 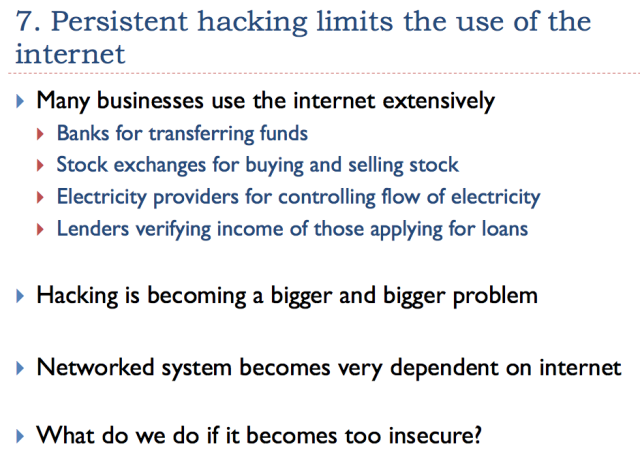 These problems are quite easy to see but solving them no one seems to truly understand what solutions would work. 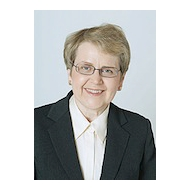 I always look forward to Gail's newest article. Advances in medical technology have increased the life expectancy of many . Advances in workplace technology assures that the many ,will not have a job. Perhaps getting rid of all technology might be an answer. Another problems is Greed. There is plenty of wealth in the world to pay higher wages, provide clean water & food to the starving . The wealthy prefer to hoard , instead of helping others. However, much like the sinking of the Titanic, you can't unhit the iceberg. And also like on the Titanic, we're all going in the water.